1. Select the Line tool in the Toolbar. 2. Select the place on the page where you want to place the line. Once you have drawn the line, you can change its angle, resize it, or move it. Select the line - a bounding box will display around your selection. 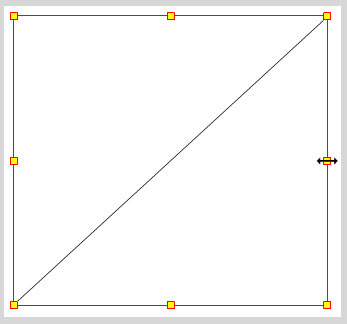 To resize the line or change its angle, select the line, then move the pointer over a handle on the bounding box. A double arrow will appear. Click and drag until the line is the length and angle you want. To move the line, click inside the bounding box, then drag the line to any position in the workspace. Simply select a border (weight) , color, and style from the Line Properties panel.